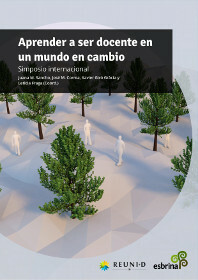 This text contains all the contributions presented at the international symposium Learning to be a teacher in a Changing World, held in Barcelona on 21 and 22 November 2013, an event organized by the consolidated research groups Esbrina – Subjectivities and contemporary learning environments (2009SGR 503) of the University of Barcelona and ELKARRIKERTUZ (IT-563-13), University of the Basque Country. The symposium provided an opportunity to discuss with the education community the sense of being a teacher in today’s world and allowed us to present and discuss the results of the coordinated research project La construcción de la identidad docente del profesorado educación infantil y primaria en la formación inicial y los primeros años de trabajo (Identidoc) (Ministry of Economy and Competitiveness. EDU2010-20852-C02-01/EDU2010-20852-C02-02), and exchange knowledge with colleagues and reflections on these issues.